The Christmas season has arrived! Here are some cute, small ornaments perfect for a miniature tree: a button tree, snowman, and candy cane ornament. This entry was posted in Christmas, Crafts and tagged Beads, Buttons, family fun, group activity, kids craft, Ornaments on December 9, 2018 by Ann. Learn more about a tree skirt and button ornaments to adorn the Legacy Patterns Wooly Tree – a miniature Christmas tree. This entry was posted in Christmas, Crafts and tagged accessory pack, appliqué, Buttons, Felt, felt tree, miniature tree, Ornaments, tree skirt on December 2, 2018 by Ann. This Inner Princess Pink tutu is perfect for a little princess in your life – especially with its bejeweled tulle! This entry was posted in Crafts and tagged Buttons, jewels, princess, Tulle, tutu on November 22, 2018 by Ann. Turn a few buttons into a cute decoration with this easy tutorial. This entry was posted in Button Crafts, Crafts, Halloween, Home Decor and tagged Bouquets, Buttons, Decorating, DIY Decor on October 28, 2018 by Michelle. Welcome spring with this adorable needle-felted chick peeking out of a paper maché egg. Embellish with buttons and he is ready for your springtime and Easter décor. This entry was posted in Crafts, Easter, Spring and tagged baby chick, Buttons, DIY spring, Easter, Easter Eggs, embellisment, needle felting, paper maché egg, spring flowers, wool project on February 27, 2018 by Ann. 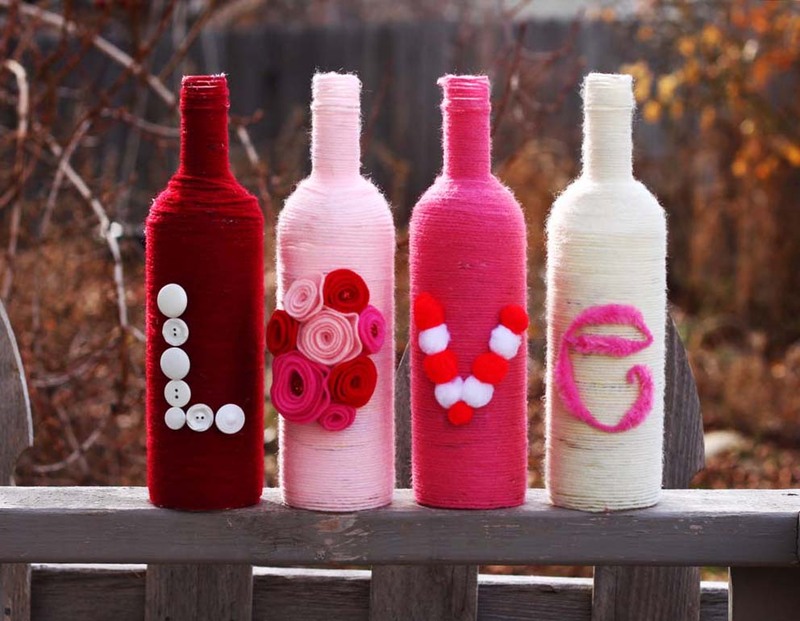 Make a set of decorative bottles that can double as vases–customize for Valentine’s Day with a few simple steps. This entry was posted in Craft Trends, Recycled Crafts, Valentine's Day and tagged Buttons, chenille Stems, DIY Valentine, Felt, flowers, LOVE, Pom Poms, recycle bottles, Yarn on February 21, 2018 by Michelle. Valentine’s Day is coming soon! Here are two versions of the Dimensions LOVE Embroidery Kit from Cathy Heck Studios for your Valentine’s décor – or as a gift to your Valentine. This entry was posted in Crafts, Embroidery, Valentine's Day and tagged Buttons, embellishment, Embroidery, framed embroidery, handwork, mini quilt, quilt as you go, rick rack on February 1, 2018 by Ann.